Great news! 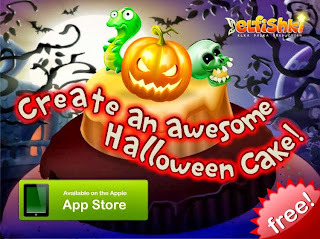 Elfishki has just released a FREE iPad game just in time for Halloween! Your kids will have a ton of fun decorating their own Halloween Cake with 24 animated spooky ingredients, including: skulls, ghosts, bugs, pumpkins and many more. ! See how imaginative and creative your kids can be, create your own Halloween Card with the cake and send it to all your friends and relatives by e-mail. See for yourself, and download it now.